I often see people clicking twice on a column’s header because they want the list to be sorted in descending ordet. Clicking twice is fine if sorting doesn’t take longer than you like. 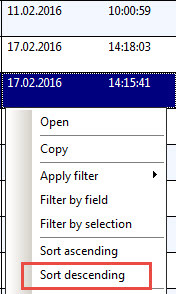 If it does: Open the context menu on the column (not the Header, but in a value field).